The annual Irish Food Writers’ Guild (IFWG) Food Awards were held yesterday in l’Ecrivain Restaurant, Dublin. Seven food producers were awarded for the “high standard and impeccable quality of their products, as well as for their unwavering dedication, devotion and commitment to Irish food”. These awards are unique because the members of the Guild are the sole nominating and decision-making body; no member can self-nominate, nor do members of the public participate. Women in the industry were well represented in every category, either winning as solo producers or with their business partners. 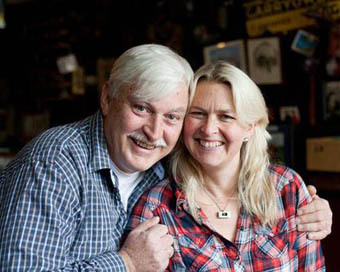 Two female food producers received special acknowledgement too – Birgitta Curtin (pictured with her husband Peter) of Burren Smokehouse was honoured for her notable contribution to Irish food. Veronica Molloy of Crossogue Preserves won the Lifetime Achievement Award for her dedication to growing on the home farm and the consistent innovation of her range of artisan Irish preserves over 20 years.